I had an interesting conversation with my daughter when she was home for Christmas this last December. She had been talking with one of her friends who thought it strange that a jeweler had wanted to charge her for polishing her ring, a service she had always received for free before. Cissy, my daughter, said that the ring looked really beat-up and needed a lot of work and thought perhaps this was the reason, but her friend did not want to pay for the work. She did take it to another store that did a basic polish on it, but she was not pleased that the ring still looked beat-up even after it had been cleaned. It occurs to me that there might be some good information in this story for my friends on Pricescope and I asked Cissy permission to use her ring as a before and after example. She graciously agreed and I am going to share some of the photos and the process with you so that you will have a more thorough understanding of the cleaning and polishing process. 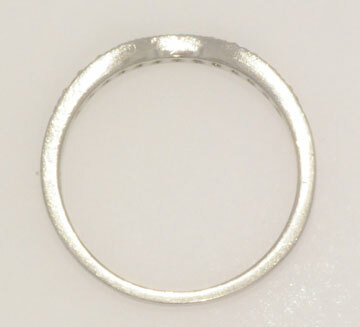 This ring is a platinum ring, so it will take much longer to polish than a gold ring, but it makes an even better illustration of why – when you completely refurbish a ring – you should expect there to be a charge. 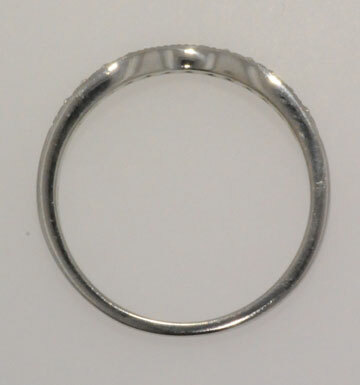 This is her ring before any cleaning at all, just as it was taken from her finger. As you might expect, there are a lot of dings and scratches in the metal, which is especially obvious in the front view. 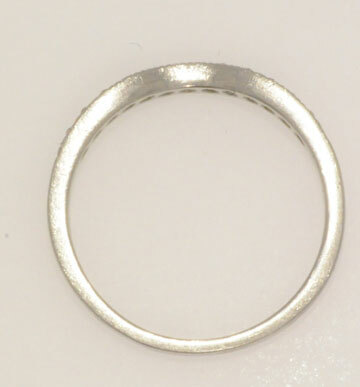 Even though the ring is cleaned regularly, it is difficult to clean it at home to keep these types of dings and scratches from occurring, especially in platinum. 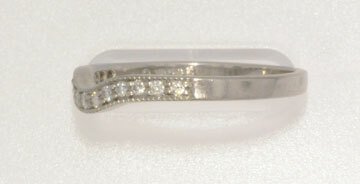 You will see that the wedding band is showing the same type of distress. Since we were at home the day these pictures were taken we did a simple cleaning using the Gemcare Products. 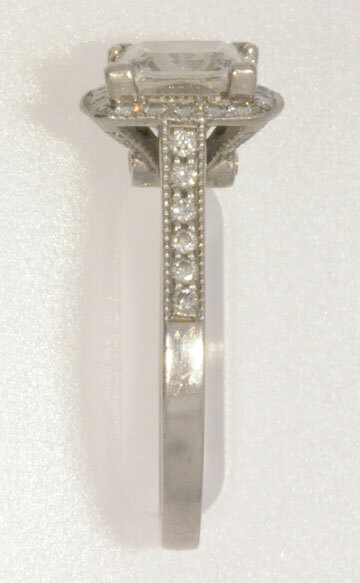 This will remove the “cookie dough” from the back of the diamonds, and remove the tarnish from the metal and it will make a great difference in the look of the ring, but it will not take out any substantial scratches. You can see also that both the front and side views also show definite improvement. 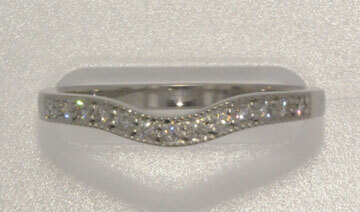 The difference is not as dramatic as you will see with the refurbished rings in a moment. One of the most notable to me areas on the side picture is towards the bottom of the shank where you can see the dark reflection of the camera lens. In the top side picture this is barely a dark smudge, but in this picture it is nearly recognizable as a reflection of the camera lens. Here are the wedding ring photos, where you can also see some improvement, although without the center stone they are more subtle. Now please remember that this was during Christmas so I was only able to impose on my bench man for one-half hour of his time. 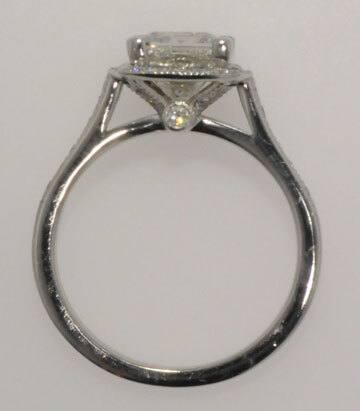 To properly refurbish a platinum ring you could easily spend an hour, unless you wanted a polish like one of the top custom designers provides, then plan on two to four hours of time, and a whopping-big refurbishing bill. Still, the differences are dramatic, and to many would be well worth the expense. Perhaps if you are a VERY good client you might expect this level of work to be for free, but if you consider the amount of time taken by a skilled bench man to do this level of work, and the other money making things that he could be doing during this time, such as setting three to four diamonds properly, then I think the practice of charging for this work is well justified and deserved. Lets look first at the top view. 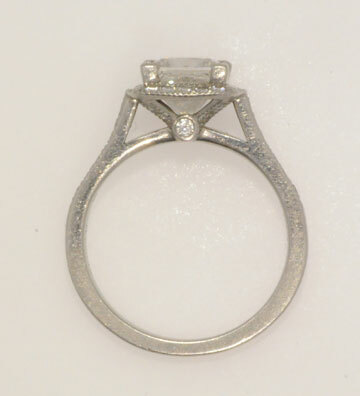 The center diamond is even brighter as now we have had the benefit of both cleaning and steam to thoroughly clean the back of the diamond. 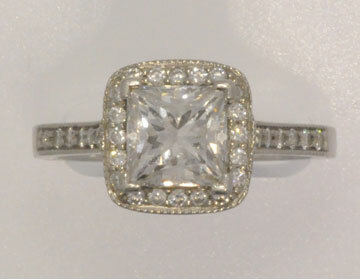 This allows for maximum brilliance from the diamond, as diamonds are cut at specific angles to allow the light to both reflect within the diamond and to refract back out to the eye of the viewer. Dirt on the diamond, especially on the pavilion of the diamond increases the apparent critical angle at which light escapes the diamond, allowing more of the light to escape through the pavilion to the tops of our fingers, which have no optic sensors to appreciate it – rather than reflecting back properly to our eyes. 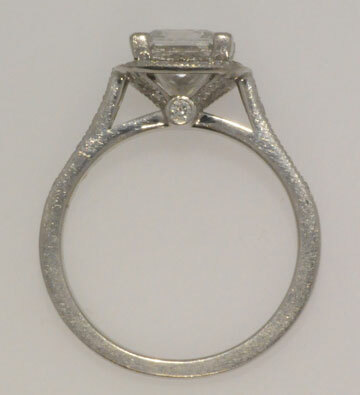 In the front view you can see that even one-half hour was not quite sufficient to remove all of the scratches in the ring. The difference in the appearance though is amazing! Look how much more exquisite the metal is, even with those remaining scratches, and how much less of them there are than before. Here is another incredible difference. Look how bright the band is now, and the reflection of the lens is clearly visible. So visible now that I realize it is not, as I thought, the lens that is reflected in the band, but rather the portal for the halogen lights that I am not using in this photograph. The curvature of the band is wrong for it to be the reflection of the lens. 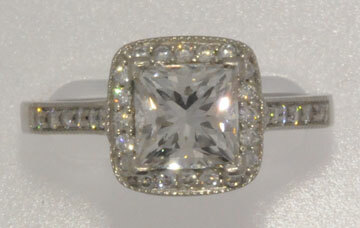 The long dark reflection in the band just below the diamonds is the aperture through which the camera shoots the pictures. Clearly though, most of the scratches are gone and the polish nearly where it should be. It would have taken another half hour to finish this to where I would like it to have been, but that was just not going to happen during the Christmas rush. I trust this transformation is sufficient to illustrate my point. 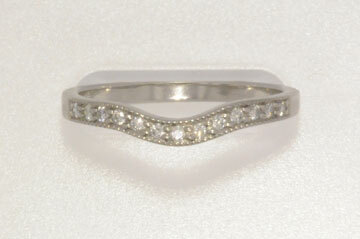 Let’s take a quick look at the wedding band after its refurbishing too. Again, I think, an astonishing difference between the opening picture and the finished pictures. 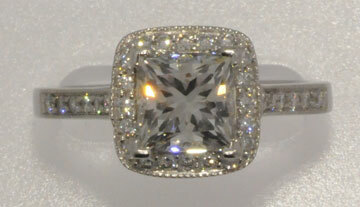 So, when you go to your jeweler, you must ask yourself, which level do you want? A quick buff and soak with a little steam, which should be free at most jewelers, especially if you purchased the ring from them. Or would you like a little more work, a nice buff to remove light scratches, and a thorough soak and steam that may cost a few dollars? Or would you like a complete refurbishing, to include a deep buff to remove all scratches, taking from one half hour to perhaps as long as two hours, depending on the metal used and how dinged up your ring is. A complete refurbishing should also include a checking and tightening of any necessary prongs, and during the course of a refurbishing any needed repairs should also be discussed at check-in and completed during the course of the refurbish. You should expect to pay for the level of service that you desire, from free to a level commensurate with the amount of work required. Perhaps, if the jeweler whom my daughter’s friend referred to had discussed what was involved in doing the work she wanted done, he might have gotten the job, instead of the dour comments made to my daughter.